If you are waiting for a signal that a global wholesale silver shortage has begun, it will likely be too late to acquire physical metal. If you are waiting for a signal that a global wholesale silver shortage has begun, it will likely be too late to acquire physical metal. Why? Because it has never happened before. So, when the world bond and stock markets finally collapse under a mountain of paper, leverage and debt, we will witness one hell of a GLOBAL RUN ON SILVER. When this occurs, individuals running to their local coin shop or calling a precious metal dealer on the phone requesting to “get sum silver”, will find out there are hundreds of poor slobs waiting in line before them. Now, when I say “poor slobs”, I am not being derogatory here. I am just using a term suitable for the masses by the banking elite. Investors need to realize, this will be nothing like the 1979-1980 time-period when Americans stood in line to purchase silver as the price surged to $50. 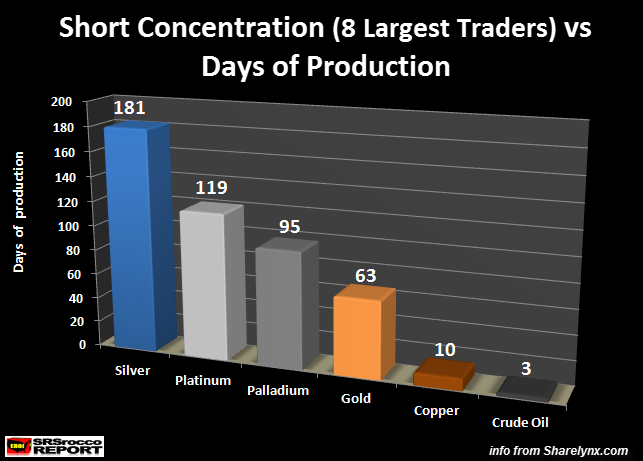 We must remember, this huge silver buying frenzy was mainly focused in the U.S. and a few western countries. Furthermore, most Americans had very little debt in 1980, and the total U.S. Retirement Market was only worth $1 trillion compared to $25 trillion today. The once proud AIG – American Insurance Group, saw its stock price fall from a high of $1,155 (chart figure above is incorrect) in 2007, to a low of $25 in 2008. Citigroup’s stock went from a high of $551 in 2007, to a low of $30 in 2008. Even though Citigroup’s stock has gone up a bit lately, its current price of $55 is still 10 times less than its high reached in 2007. 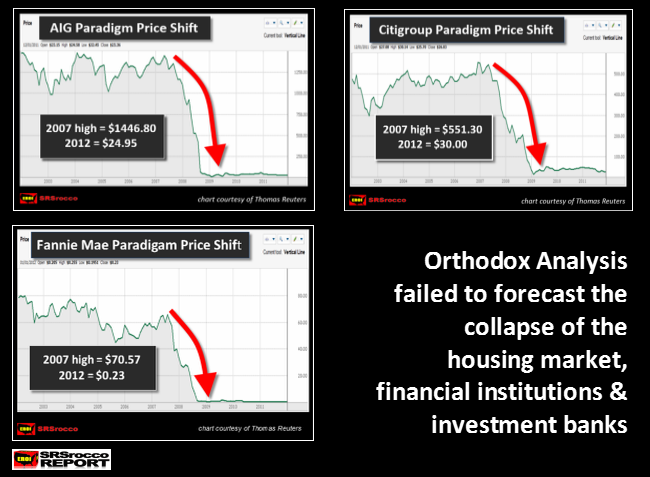 So, this next financial and market collapse will make investors beg for 2008-2009 all over again. •The Exclusive Distributor for the leading private mint 100 oz Silver bars in the US advised SDBullion on Thursday that the mint had been scheduled (and promised) to deliver 10,000 100 oz Silver Bars on Wednesday (1 million oz of a single private mint product), but was only able to deliver a little over 3,000 bars. Shortages of retail forms of gold and silver, which are anything less than 400oz gold bars or 1000oz silver bars, does not necessarily tell us about whether there is a real shortage/price disconnect in the wider precious metals markets. Retail shortages to-date have reflected a shortage in production capacity, rather than a shortage of wholesale gold or silver. How can I tell if it is a real shortage, or just a production capacity shortage? A real gold bank run will manifest itself in the wholesale markets for 400oz gold bars or 1000oz silver bars, so to identify a real physical-paper disconnect occurring you need to look at the premium above spot for 400 oz or 1000 oz bars. Let me start off by saying, “I agree with Bron that a chronic wholesale shortage will occur in the larger 1,000 oz bar market.” Bron goes into detail in the article describing how retail bar and coin products may be in short supply, but investors can still purchase 1,000 oz silver bars on the wholesale market without delay. However, when the shortage makes itself shown in the wholesale 1,000 oz bar market, IT WILL BE TOO LATE FOLKS. This is the problem. And this is where I may differ with Bron on the present silver market situation. While Bron and many others who say, “We need to see a shortage of 1,000 oz silver bars for a real shortage to occur,” unfortunately, this is a signal that tells us the SHIP HAS ALREADY SUNK. Investors need to realize the market has suffered several retail silver shortages since 2008. You need to understand that these were “Tremors” for the massive earthquake to come. Who wants to wait for an earthquake to get prepared?? Folks, these huge spikes in retail (and minor wholesale) demand are blinking red lights and sirens going off warning of the major global silver run in the future. Basically, the top eight traders are short half a year’s worth of world silver mine supply. That’s a great deal of leverage by these traders as the world enters into the next financial collapse. I would imagine this leverage just might add serious fuel to the rising paper price of silver, as these traders experience one of the greatest silver short-squeezes in history. There still seems to be a great deal of misinformation about the silver market. Unless you are an individual who has followed and invested in silver for many years, most people have no clue about what is really going on. I had one reader make a comment recently that, “Physical silver bar and coin demand was only a small component of the overall market.” Of course, I begged to differ. Prior to the collapse of the U.S. Housing Market and Investment Banking System, total global silver bar and coin demand was only 51.2 million oz (Moz). These figures are from the Silver Institute (based on data from Thomson Reuters GFMS). However, in 2014, that figure nearly quadrupled to 196 Moz. In 2007, silver bar and coin demand represented only 5% of global silver supply, but in 2014 this increased to nearly 20%. Thus, global silver bar and coin demand was the largest growth sector of the entire silver market…. by far. Now, the next two bars in the chart (on the right side) represent my estimation of a doubling and quadrupling of 2014 silver bar and coin demand. There is no way of knowing, but estimates state that only 1% of the market (or less), purchase silver. If we figure that there are roughly 7 billion people in the world, 1% would be about 70 million investors. Which means, these 70 million investors bought an average of 2.8 ounces of silver bar and coin in 2014 (196 Moz divided by 70 million people = 2.8 oz). Of course this isn’t correct, as many investors are purchasing 100’s & 1,000’s of ounces of silver at a pop. Okay, for kicks and giggles, let’s just say half of the people in the world might be investors. So, 1% of 3.5 billion is 35 million, netting an average 5.6 oz for each investor (based on 196 Moz purchased in 2014). Again, this is way too low of an average. It just goes to show that physical silver buying is by a small fraction of the market. If we assume this small fraction of buyers quadrupled their purchases of silver after the collapse of the U.S. Investment Banking System and Housing Market (51.2 Moz in 2007 to 196 Moz in 2014), just a doubling of the 2014 silver bar and coin figure would represent an annual increase to 392 Moz. Which means, just waking up another 1% of investors to purchase silver would increase global silver bar and coin demand to nearly 400 Moz. This would consume nearly 40% of total world silver supply. Now, what would happen if we had a quadrupling of silver investment demand, as we did from 2007 to 2014? It would push global silver bar and coin demand to 784 Moz., accounting for more than three-quarters of world silver supply. Of course this would never happen as there just isn’t that much available silver in the market. Let me explain. While the world holds approximately 1.8 billion ounces of silver in “Identifiable Above-Ground Silver Inventories”,only a small part of this amount would be available for the market. The majority of this silver is held in Custodian vault stocks (923 Moz) and ETF’s (503 Moz), with the remainder held in Exchanges, Governments and Industry. These figures are from the 2015 World Silver Survey, based on year-end 2014. 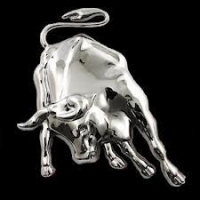 Investors need to realize, the silver held in Custodian vault stocks and ETF’s will not be available for sale when the Global Silver Run takes place. Institutions, large entities and individuals who have invested in silver that is stored in Custodian vault stocks or in ETF’s will not want to liquidate their metal. Well, maybe a small fraction, but who would sell one of their best performing physical assets? So, where would this supply come from to satisfy a doubling (392 Moz) or a quadrupling (784 Moz) of physical silver investment demand? Well, the Future Exchanges is probably one of the most liquid places to acquire metal. 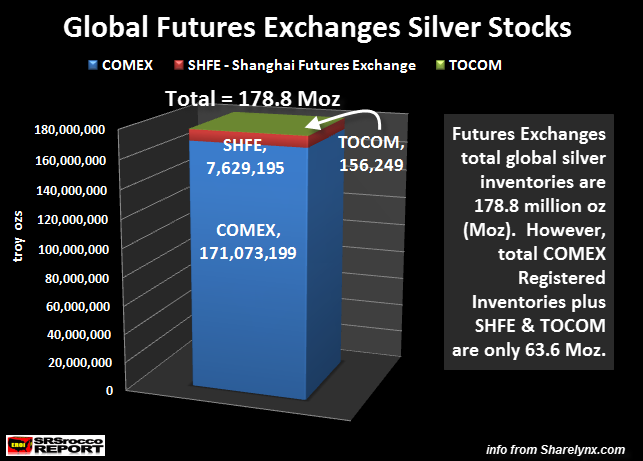 According to data from Sharelynx.com and the CME Group, there is only 178.8 Moz of silver held at the world’s exchanges. Now, these are the only exchanges that provide public data on silver inventories. As of yesterday, the three Futures Exchanges held 178.8 Moz. The COMEX held the most at 171 Moz, followed by the SHFE – Shanghai Futures Exchange with 7.6 Moz, and the TOCOM in Japan with a lousy 156,249 oz. However, the COMEX stores its silver into two categories…. 115.2 Moz in the Eligible inventories and 55.8 Moz in the Registered category. We must remember, the Registered category is the only silver ready for delivery into the market. Eligible silver can become registered and deliverable if the owner of the silver declares it salable at some price. How many investors who have their silver stored at the COMEX in the Eligible category will offer up their metal during a GLOBAL RUN ON SILVER? I would imagine very few. That being said, even if we assumed that all of the 178.8 Moz of silver held at the exchanges was available for the market, it wouldn’t even be enough to for fill for the doubling of the 2014 demand of 196 Moz. So, I believe when we finally see a mad rush into physical silver on a global scale, it would be quite difficult for the market to supply 392 Moz (doubling of 2014 demand) of physical bar and coin demand. Which means a quadrupling to 784 Moz would virtually impossible. This huge increase in physical metal demand would cause severe stress on the market which would push the price of silver to levels thought unimaginable. Except for a few individuals, most investors want to purchase smaller silver bar and coins. Even wealthy investors rather own either 100 oz bars or smaller coins such as Monster boxes of Silver Eagles, Maples or Philharmonics. Who wants to haul around a 1,000 oz parking lot bumper sized silver bar that weighs 65 lbs? So, when extremely wealthy individuals or mom and pop investors want to acquire silver, they are going to call up a dealer and order standard investment bars and coins. So, it makes sense that these retail silver products will show shortages first. When I talk to some of these larger dealers, they have clients purchasing 6 & 7 figure single orders of gold and or silver. These investors aren’t buying 1,000 oz bars of silver, but rather the 100 oz bars (or smaller denomination) coins and rounds. If we are already seeing a backlog of weeks or months for some retail silver products, when the shortage finally makes its way into the 1,000 oz bar market, it will be too late. So, trying to determine the difference between a “Product Shortage” and a “Global Wholesale Shortage” will become meaningless when the latter arrives. I want to conclude this article by saying, “If you are trying to time the market to purchase silver, you may be making one hell of a lousy investment strategy.” Again, the coming Global Run On Silver will occur quite suddenly. There may be no time to prepare and place an order that will likely be filled. Now, I am not saying this current retail (and minor wholesale) shortage is the making of the BIG ONE. However, watching the carnage taking place in broader stock markets may give us a clue that the great RESET is coming sooner than later. If you take a look at the charts at the top of this article, you will see just how fast the values of these stocks imploded. 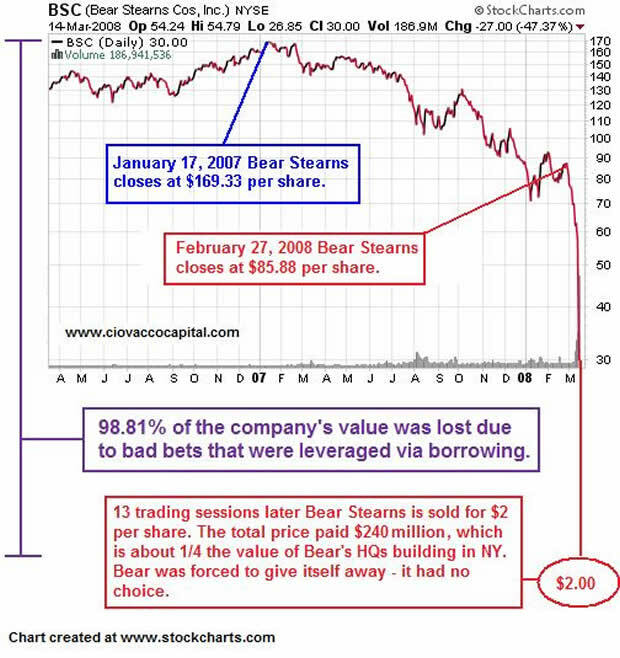 Bear Stearns went from a $96 stock to $2 in just 13 trading days. I believe this is how the next Global Financial and Economic Collapse will occur. Because the amount of leverage is so much more extreme today than it was in 2008, we are going to see market volatility like we have never seen before. Lastly, there is no way to predict how the future unfolds in this highly leveraged debt based financial system. Some analysts may say articles stating of a current “Silver Shortage” are guilty of propagating HYPE. I don’t see it has hype, but rather as valuable information describing what is taking place in the physical silver investment market. Whoever heard of a large shortages of retail silver jewelry or silverware? Investors need to wake up to important information that is right in front of them. Again, I believe the retail silver shortages we have experienced in the market since 2008 are warning signs for the big event to come in the future. Analysts waiting for the “Big Global Wholesale Silver Shortage”, may turn out to be correct in their prediction. Unfortunately, this will likely occur at the same time the silver market experiences surging investment demand, with little or no available supply.